Fort Lewis College junior Austin Butala works in the Electricity and Magnetism Laboratory inside the Sitter Family Hall on the campus Thursday. The new hall will be dedicated at noon Friday at a public ceremony. 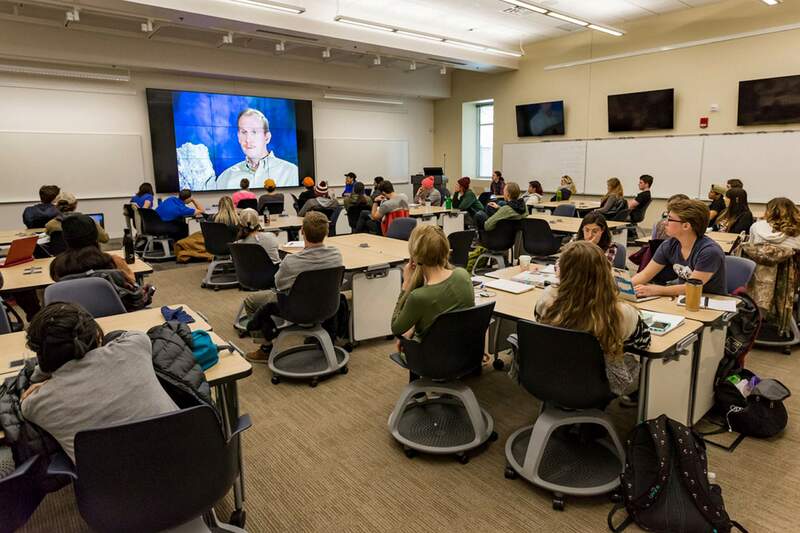 Fort Lewis College students enjoy one of the new smart classrooms in the geosciences, physics and engineering hall, now named Sitter Hall. In some classes, the work at each table will be transmitted to a screen on the wall so the professor can see the progress teams are making and share their solutions with the rest of the class on the big screen. Sitter Family Hall, which houses the geosciences, physics and engineering classrooms, labs, offices and study areas, as well as an observatory on the roof, is seen from the northwest. The official ribbon-cutting will take place at noon Friday. 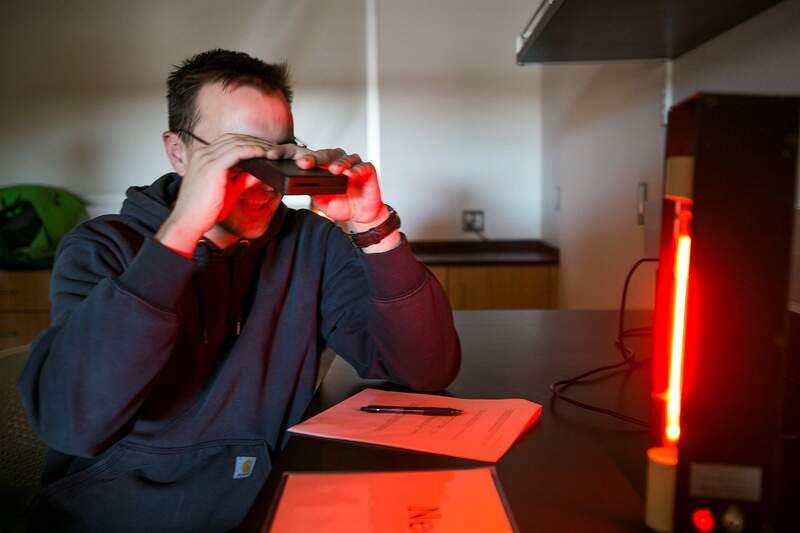 Students have enjoyed the state-of-the-art labs, classrooms and study areas since January, but on Friday, the community will have its chance to check out the new geosciences, physics and engineering hall at Fort Lewis College. “A lot of people are walking through and getting fired up about what this means to the college,” said Mark Jastorff, FLC vice president for advancement, adding that his office has given a number of tours to potential donors. More tours, including for groups such as Leadership La Plata alumni and members of the League of Women Voters of La Plata County, are on tap for the coming weeks. The fundraising will continue – Jastorff’s office has raised about $2.2 million of the campus goal of $4.2 million, with several pledges and gifts in negotiation. The remainder of the funding for the $35 million facility came from state of Colorado capital funds. Twenty eight gifts that led to naming opportunities have been confirmed. The front courtyard, which features one of the building’s references to the history of science with a sundial, will be named the FLC Foundation Courtyard in honor of its $600,000 gift. A new monikerThe hall is opening with a new name, Sitter Family Hall, after a major land donation, considered the largest land gift in the college’s history, from the clan. The donation, appraised at about $2 million, consisted of property in the Durango area. The largest cash donation honors, he said, go to the Robert M. & Roberta Armstrong Barr Foundation, with $1.4 million donated to provide scholarships for future teachers. Richard and Mary Lyn Ballantine have the honors for the largest in-kind donation, the $5-million Durango textile collection given to the Center of Southwest Studies. The idea of applying the land donation toward the hall was matriarch Marjorie Sitter’s idea. Doug Sitter was a member of the Fort Lewis College Foundation Board of Directors for several years, where he played a major role in bringing in gifts, the college said in a news release. The FLC Board of Trustees approved the name selection at its December meeting in executive session, but the name change was not announced until the end of March – just before the letters were added to the building. “This is a fitting acknowledgment of a gift that continues to influence the lives of our students in so many ways,” FLC President Dene Thomas said. 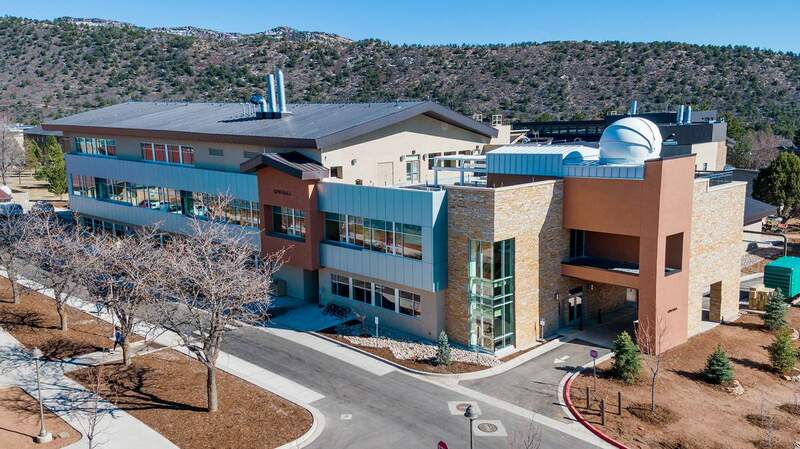 A dedication ceremony, ribbon-cutting and open house for Fort Lewis College’s new Sitter Family Hall, which houses the geosciences, physics and engineering disciplines, will be at noon Friday. Parking on campus will be free after 11 a.m.